HANOI — One of Vietnam's leading dissidents, Catholic lawyer Le Quoc Quan, has been sentenced to 2 1/2 years in jail for tax evasion, a charge critics say is politically motivated. About 500 people marched through Hanoi Wednesday morning causing traffic snarls for over an hour until they were blocked by police. Wearing matching t-shirts and holding palm leaves as symbols of peace, the group showed support for Quan, one of the country’s most prominent activists and bloggers. Quan, 42, ran a consultancy company and in his spare time wrote a blog under his own name which reported on civil rights, political pluralism and religious freedom. On Wednesday, he was found guilty of evading $30,000 of corporate income tax in 2008. Aside from the sentence, Quan was told to pay a fine of $56,000. 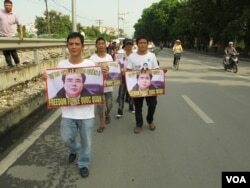 His chief accountant, Pham Hong Phuong, 31, was jailed for eight months. One protester, who gave his name as Khang, said he believed Quan was a patriot and that the charges against him were false. A limited number of observers was allowed to watch the court proceedings from an adjacent room via a closed circuit television which was frequently cut off. One reporter for a foreign news agency said he was prevented from accessing the courtroom for over an hour after the trial started, despite having an official pass. During the trial, Quan said he was the victim of political acts and that he knew he was innocent under the eyes of God. Quan was arrested in December of last year after months of what he described as increasing intimidation by security forces. His youngest brother, Le Dinh Quan, was arrested in October, also charged with tax evasion. His middle brother, Le Quoc Quyet, said authorities were targeting his family. A week before his brother’s trial, Quyet said police detained him and several activists while they were drinking tea at the house of blogger Tuong Thuy. Quan became known as a dissident in 2007 when he was arrested days after returning to Vietnam from the United States where he had spent several months as a fellow of the National Endowment for Democracy, which is funded by the U.S. Congress. In 2011, he attended a series of protests in Hanoi against Chinese actions in territory also claimed by Vietnam, the Paracel and Spratly islands, which are believed to be rich in oil and gas reserves. His trial was originally scheduled for July 9, but the day before the trial the People’s Court of Hanoi announced the presiding judge had fallen ill. Some observers attributed the date change to an invitation by U.S. President Barack Obama to his Vietnamese counterpart Truong Tan Sang to visit the White House.